Regular readers will know that every three months or so for over 2 years now, Amphora has sent executives out to India, to spread the fine wine investments message. 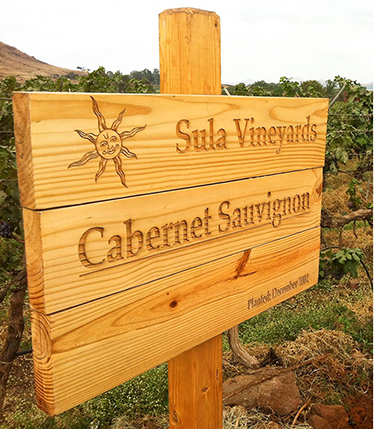 Last week, we were lucky enough to be able to spend a day at the delightful Sula Vineyard, a hair-raising 3 hour drive north east of Mumbai. What has that got to do with wine investment, you may ask? Or was it simply an arduous perk. Sula’s first vintage was, propitiously enough, the Millennium year, and they now produce an excellent selection of wines of differing hue, as well as a lovely ‘method traditionale’ champagne. They also sell imported wine, and have a relationship with Hardy’s in Australia, for example. From relatively small beginnings, it has expanded capacity and now enjoys a domestic market share of over 60%. What we must understand, is that this is not 60% of a thus far painfully small figure. As we have been at pains to stress, whilst the older generations of Indians grew up drinking principally beer and whisky, this has not been changing rapidly in recent years, and the affluent younger generations are being won over to wine – much like in the UK back in the 1980s. We visited on a Wednesday, and couldn’t help but marvel at the number of visitors. Imagine our surprise when this was reinforced by the statistic that over the last year they have received over 250,000 similar visitors through the turnstiles. That averages out at nearly 700 per day. The point here is that India is well on the way to becoming one of the world’s great wine consumers. This will percolate from bottom to top in terms of wine quality. We’ve mentioned in the past how imports of fine wine face an exorbitant 160% import duty, which currently inhibits domestic sales of imported fine wine investments. We wouldn’t put money on that duty figure disappearing any time soon – but it is certain to over time. Fine wine investments, being a medium to long term proposition, will definitely benefit at some point. Moving away from India. 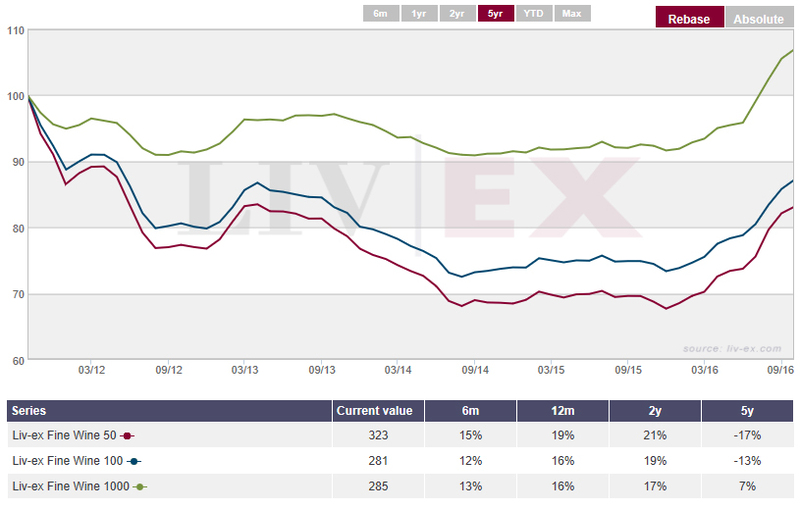 The wider fine wine investments market continues to enjoy itself: a further hike of 1.59% for the Liv-ex 100 in September registers the 10th monthly rise. So is the complexion of these rises evolving at all? We know that the broader market outperformed Bordeaux during the correction and consolidation phases from mid-2011 to date. More recently, though, Bordeaux’s return to fashion has seen it nudge ahead, the narrower ‘50’ outperforming the larger ‘1000’ by 500 basis points on both a 1 and 2 year view, as you can see from the table attached to the graph. Interestingly, there are signs of that situation evolving too over the last 2 months. Here is the ‘50’ against the ‘100’ over 6 months. Lock-step until mid-June 2016, then the referendum acting as a starter’s pistol for the First Growths to power ahead. Though the chart doesn’t capture it, the last month has seen a slight change of focus in favour of the Liv-ex 100 over the Liv-ex 50. 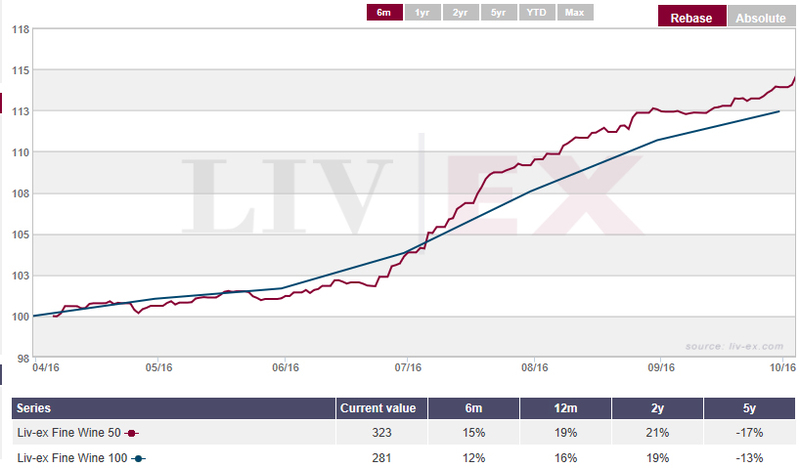 The Liv-ex 50 comprises the last ten physical (already bottled) vintages for the First Growths, whilst the Liv-ex 100 is broader in respect of its wine investment constituents. In a sense, it is almost a microcosm of the Liv-ex 1000 because it is not restricted to French producers. It comprises wines from Burgundy and Champagne, various Super Seconds and wines from the Right Bank – as well as one or two from Italy, Spain and the USA. In this last month, the rate of increase of the ‘100’ has exceeded that of the ‘50’ by a substantial margin. They’ve both done well, but the ‘100’ has done especially so. It’s far too early to draw any substantive conclusions from a single month’s data, but at some stage, we’ll look back and be able to tell when the fine wine investments market’s focus switched from the First Growths. We’ll keep an eye on all of this, obviously – because it’s particularly useful when we’re determining the optimum weightings for client portfolios. Finally, we mentioned in last week’s note the importance of making sure you invest in fine wine at the right price. We’ve had quite a few people asking about the best way to avoid getting ripped off. The answer is at your finger-tips. Wine Searcher is the best indicator. It’s an online market place that amalgamates advertised offers from a multitude of sources. A quick glance will illustrate that the prices on show can display a pretty wide spread – but all of the advertisers can be called to see if their offer is real. Remember though that these are by and large the merchants’ best offer prices. An analogy most people will understand is that the might be viewed as the best ‘forecourt’ prices. Can you buy more cheaply? Absolutely, and it is by trying to match willing buyer and willing seller that we at Amphora are able to get inside the merchants’ bid: offer spread, a crucial element of engineering enhanced investment returns.